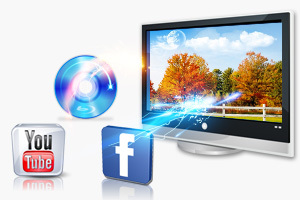 Make vivid slideshows of photos, videos and music in your favorite style. Personalize slideshow with transitions, themes, menu templates, effects, captions, etc. Encode slideshow to MP4/MOV video for playing on iPad, iPhone, Android, etc. Burn slideshow to DVD disc for watching on TV with home DVD player. Video to DVD burning is supported! New! 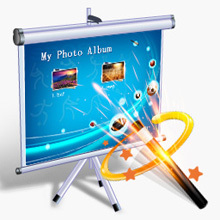 DVD Photo Slideshow for Mac is an excellent slideshow maker app that lets you create fantastic slideshow movie and burn gorgeous slideshow DVD with ease. With this Mac photo slideshow creator, you will be able to make lively slideshows of your favorite photos, videos and music in only a few steps. The Sync Music & Slideshow option helps you make music slideshows for your favorite songs as well. This Mac slideshow app also provides dozens of transition effects, theme styles and DVD menu templates for you to choose from. To make your slideshow more meaningful, it also allows you to add text, bubble text, arrows, lines, etc. to each photo slide. Besides, there are other options to loop slideshow, set photo duration and transition duration, set Pan & Zoom, rotate image, crop image, and more. 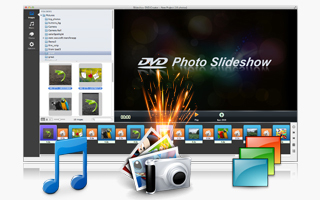 DVD Photo Slideshow for Mac enables you to encode slideshows as MP4 or MOV video files so that you can transfer and play them on mobile devices like iPad, iPhone, iPod touch, BlackBerry, Android Phone & Tablet, etc. or upload them to social websites like YouTube and Facebook. It is also the best iDVD alternative that you can use to burn slideshows to DVD discs on Mac OS X 10.7 Lion, 10.8 Mountain Lion, 10.9 Mavericks, 10.10 Yosemite, 10.11 EI Capitan and 10.12 Sierra. 1. Drag photos and videos from iPhoto or other folders to the timeline. 2. Add songs from iTunes, GarageBand, or other folders to the timeline. 3. Choose a theme style. 4. Press the Play button to preview your slideshow. The slideshow created with default transitions, themes and settings may not win your heart. Why not customize it in your favorite style? DVD Photo Slideshow for Mac offers various theme styles, transition effects and menu templates which you can choose from to apply to your slideshow. The optimized DVD menu template helps you easily create birthday slideshows, wedding slideshows, Halloween slideshows, baby slideshows, Christmas slideshows, and more. There are also options to add text / bubble text / arrows / lines to each slide, add blank image, rotate text / photo, set Pan & Zoom, arrange photo order, crop image, adjust exposure / contrast / sharpness / saturation..., and more. 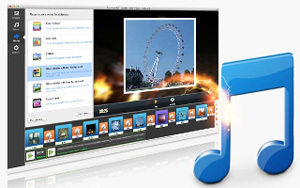 DVD Photo Slideshow for Mac is also a great tool to make music slideshow. To create a music slide show, you just drag your favorite photos and video clips, add your favorite song, and tick the Sync Music & Slideshow option. If you are patient enough, you can even add lyrics to the slideshow. There are also the options to customize duration for each photo and transition and to loop the slideshow at the end. In the process of creating your slideshow, you can preview your work to check the real time effects. When everything is okay, you can choose to encode the slideshow to a *.mp4 or *.mov movie file for transferring and playing on mobile devices like iPad, iPhone, BlackBerry, Windows Phone, Samsung Galaxy Series, HTC Phones, other Android Phones and Tablets, etc. or uploading and sharing on social websites like YouTube and Facebook. Besides, DVD Photo Slideshow for Mac lets you burn slideshow to DVD playable on TV with home DVD players. It is a great way to preserve and share your precious moments.